The other night Wil and I went to a lecture at the UW, part of their "Serious Fun" lecture series. Why? Because we Very Serious About Fun. The series brings together experts from various disciplines at the university to talk about non-traditional, interesting topics. We missed a talk about Rhythm which featured a poet, a musician, and a historian. 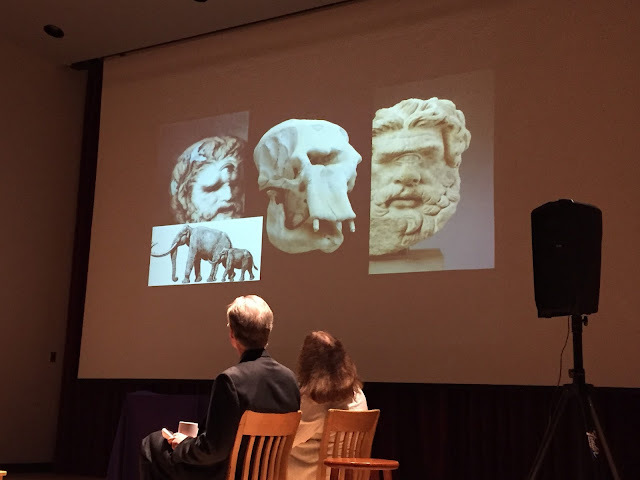 We also missed a talk about Mysteries and Secrets which featured a Scandinavian scholar, an astronomer, and a historian. But this talk? Well, it was about DRAGONS. The first speaker was Robin Stacey, who is most likely my second favorite historian of all time. I studied medieval history with her, and really love her way of teaching and sharing her passion for history. Years back Wil and I went to her Alumni Association History Lectures, where she lectured on Tolkien and blew my mind when she noted that Tolkien was a "war poet" -- like Wilfried Owen -- which really enhanced my sense of Mordor and LOTR in general. 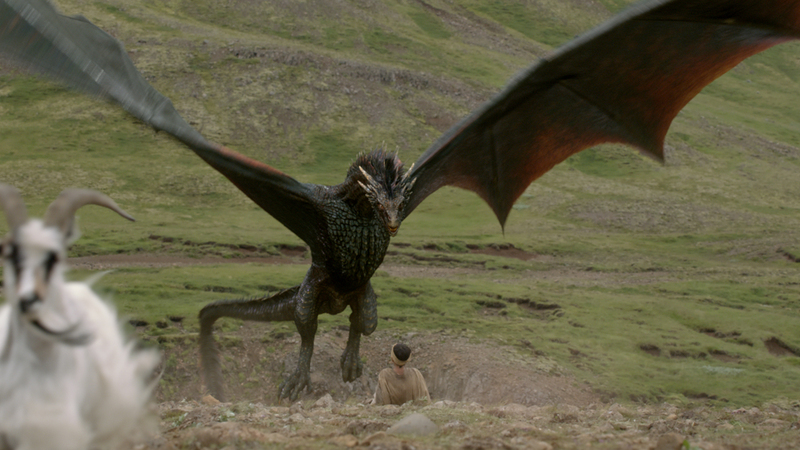 Stacey spoke about dragons and Tolkien, and what they meant to him: "I desired dragons with a profound desire." In short, for Tolkien, while he was of course steeped in the RC tradition of dragons = the devil = devil, he also saw dragons as the essence of Faerie. And Faerie was important *because* it was escapist -- something to brighten dark times. 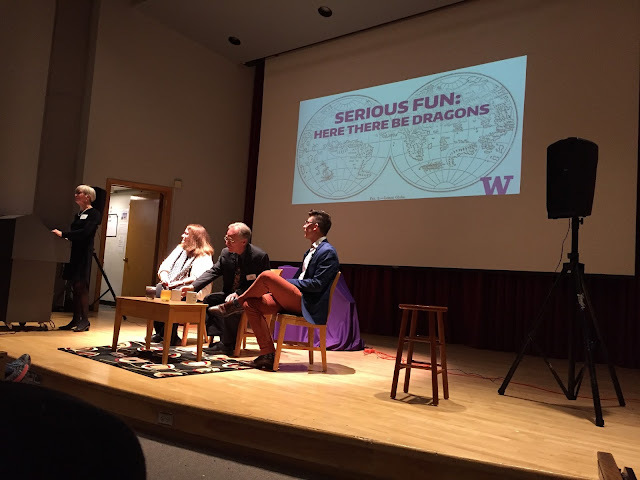 Then Chris Hamm from the Asian Languages & Literature department spoke about dragons in the Asian tradition -- and just how differently they are seen. In Asia dragons are the zoomorphic representation of heaven -- the divine energy of heaven. He discussed how the Emperor -- who was the "Son of Heaven" -- wore the dragon on his robes, but that often one only glimpses parts of the dragon in Asian art … glimpses of the divine. And then … the amazing Brandon Peecook, a PhD graduate now at the Field Museum in Chicago, who approaches dragons from a "comparative anatomy" angle. And… well… WOW. 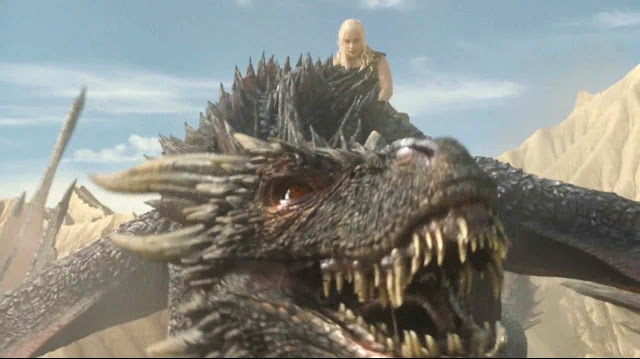 Later he turned to the stars of the talk… Dragons. He showed us gifs of dragons from movies and TV, discussing how they *might* be possible, in nature. 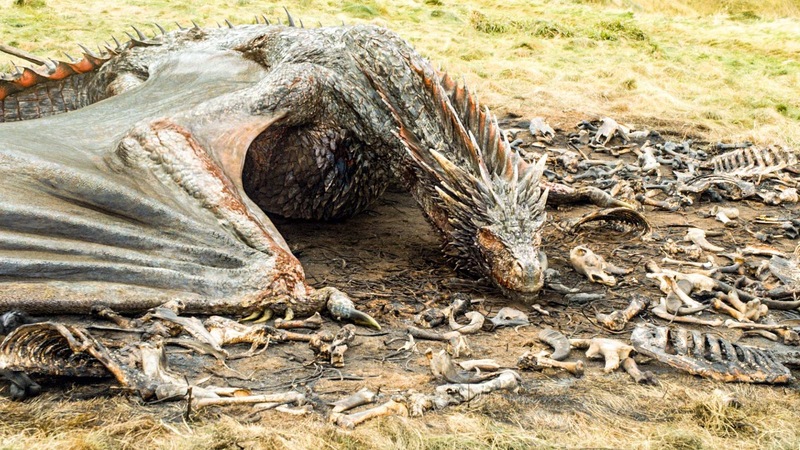 Most of them were from Game of Thrones … everyone's (current) favorite dragons. He showed a picture of a dragon skull from the basement of the palace. 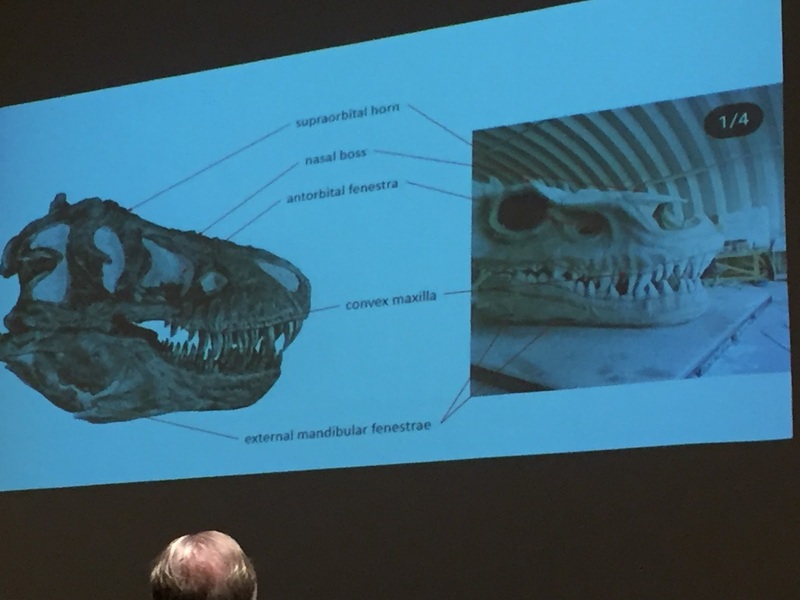 Then he showed a T Rex skull -- "clearly the front half of this skull is a T Rex skull … so that's possible." Then he showed us a gif of Drogon blinking, where you could clearly see the nictitating membrane -- you know, the inner eyelid that reptiles have. "It's a tiny thing that most people wouldn't notice … they didn't NEED to do it, but they did, and that's nice." He showed Drogons legs and feet -- how they have a rear-facing toe like a chicken, and how the legs are clearly T Rex legs. 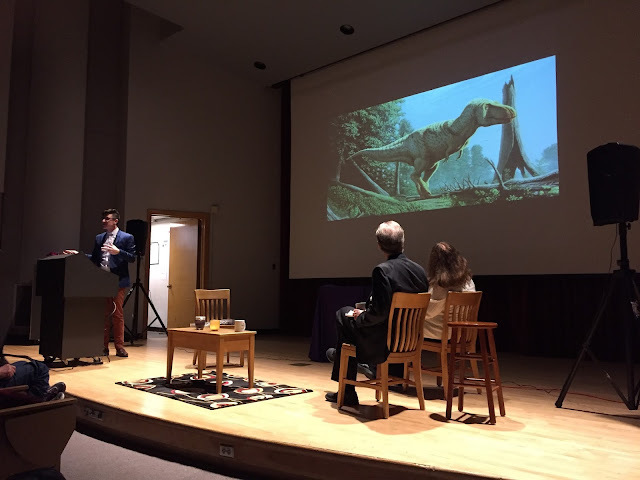 "So, again, that's possible… in nature…"
Clearly those legs are T Rex legs. CLEARLY. Then he showed a clip of the dragons hovering and shooting fire, and asked where in nature we see something like that. A bunch of people in the audience -- and we were RAPT, by the way -- shouted "Hummingbirds!" … so he replied, "HUMMINGBIRDS CAN SHOOT FIRE?!?!?!?!" But then he showed us footage of a beetle that can shoot boiling hot hydrochloric acid (Seriously! It's called the bombardier beetle!) 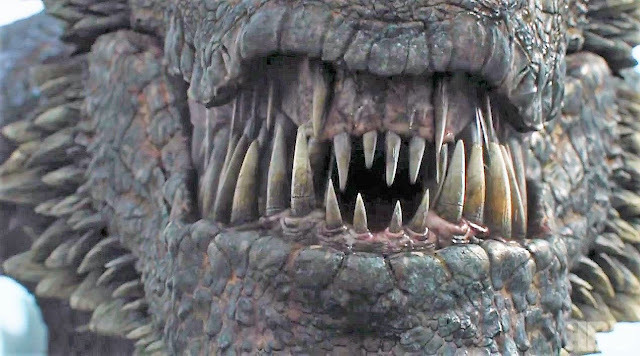 and said, "So that's kinda possible…"
But it wasn't all praise for the Game of Thrones dragons... he showed Drogon's forked tongue, which was silly "because snakes use that to stick up into their brain so they can 'smell', and that tongue is way too short, so NO." 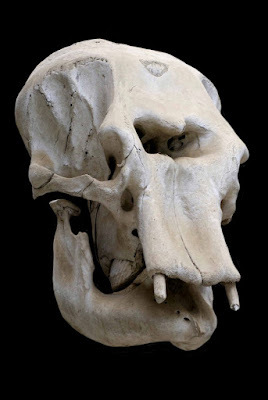 He also showed us the teeth, but dismissed them simply with "that tooth structure is ridiculous, so let's forget about that." And then we talked about wings, and how flight has developed three times in vertebrate animals in history. We got birds and bats pretty quickly, and then stalled and he said, "I can't believe you've all forgotten about the pterodactyl!" By then all of us had BOUGHT IN. When I excitedly told my pal Rebecca about the talk she said, "I love it when people love their work so much that they can excite everyone around them." And, yes, now we need to binge watch the past season of GOT to get ready for the final season. Our next (and FINAL!) 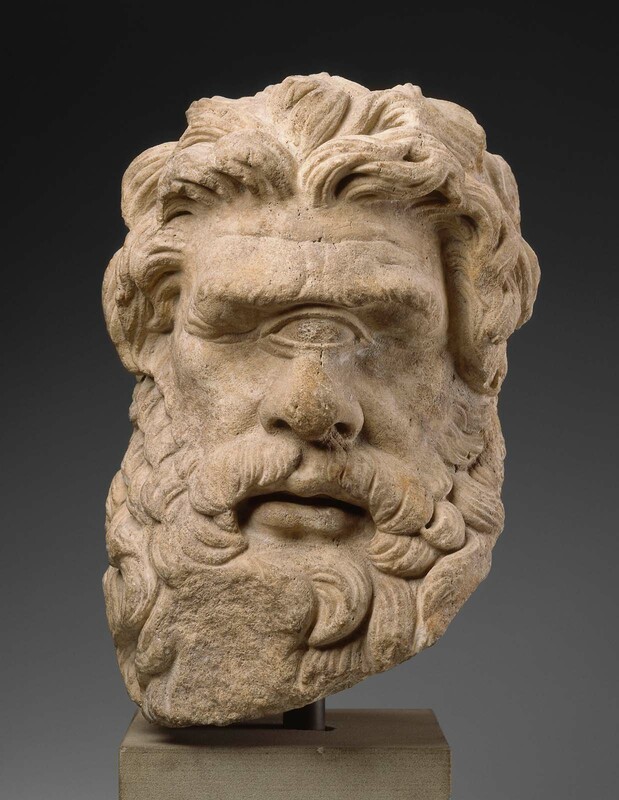 Serious Fun lecture features a Classicist, and Artist, and a Cosmologist to discuss how we interpret, measure, and experience the passage of time. Come an join us on April 25 at the UW. Learn more and sign up here. 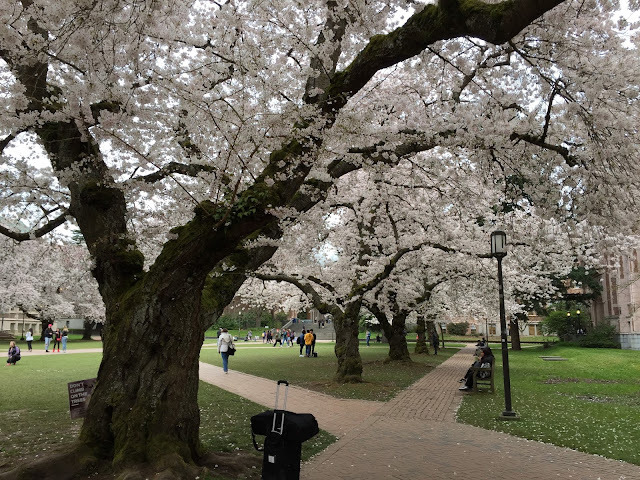 PS: As an added bonus we got our Sakura on in the Quad. Lovely!!! oh wow, that sounds fascinating! There is an annual series of lectures in my home town about science. last year they were really exciting and interesting (down to the passion of the lecturers), but the topics don't look so great this year. The university offers a lot of public lectures, including an annual history series that is organized by the Alumni Association. But the topics are still hit and miss! But we really couldn't resist a talk about dragons!!! ooooh those sound like some really interesting talks! I always assumed that us humans believed in dragons, after early civilisations finding dinosaur bones and needing to explain them. And the T-Rex would have made one hell of a scarey dragon if he'd been able to fly and breathe fire! We saw our first hummingbird of the year last night and I kept thinking "HUMMINGBIRDS CAN SHOOT FIRE!?!?" That sounds like a wonderful lecture series!